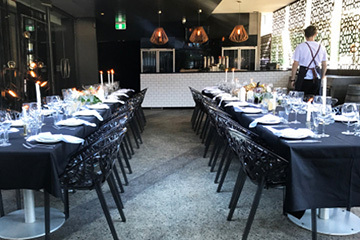 Among the popular function venues in Perth, the Universal Bar in the hip suburb of Northbridge embodies a rich history as a function space and live music venue that can be hired for private parties and celebrations as well as corporate functions, cocktail parties, corporate training sessions, work presentations and more. Ideal for functions 60 - 130, a large alfresco outdoor area with a retractable roof and private bar. Perfect for cocktail style functions, and seating can be organised to suit corporate functions such as presentations and workshops. The Back Lounge is located downstairs at Universal Bar, and is very popular for cocktail parties up to 90 people with high top tables and stools. As its name suggests, the Front Bar is at the front of the venue, with two function areas available with a dancefloor and perfect for up functions up to 30 guests, including birthday parties, group functions, hen's nights and work functions. Exclusive hire is available for group functions of 150 or more people. Features two bars, audio visual facilities, screens, lounge area and seating options. For groups of 250 or more, Universal Bar can be hired exclusively over two levels, which includes the Rooftop Terrace Bar.